The movement toward freer markets in the so-called transitional economies (TEs) has led to great interest in the marketing literature (Batra, 1997; Fahy et al., 2000; Li et al., 2006; Marcinskas and Gliniené, 2005; Yiu et al., 2005; Harmaus et al., 2008). One of the most important challenges facing TEs is improving fundamental marketing competencies (Bartra, 1996) and the performance of state-owned enterprises (SOEs). The role of marketing in these economies is more fundamental to their development than to other countries of the world (Kaynak and Samli, 1984). Hence, it is essential to research the marketing practices and market orientation of companies in TEs and their impact on economic development and transformation (Kaynak and Kara, 2004). A significant body of research on marketing practices in TEs deals with market orientation (MO). MO is considered as the firm’s adoption of the marketing concept (Kohli and Jaworski, 1990; Narver and Slater, 1990). However, marketing capabilities are much more than just MO because they consider other features like marketing competitiveness (Fahy et al., 2000). Research on MO and/or marketing capabilities (MC) has been carried out in several TEs such as Russia (Golden et al., 1995), Bulgaria (Marinov et al., 1993), Czech Republic (Savitt, 2000); Hungary, Poland and Slovenia (Hooley et al., 2003), Ukraine (Akimova, 2000) and China (Kaynak and Kara, 2004; Liu et al., 2003; Tse et al., 2003), but never before in Cuba. Although Cuba is not a free market, the Cuban economy is more open and less regulated than it was ten years ago, hence marketing is a key ingredient for its economic transition (Hernández et al., 2004). Most studies on marketing or MO in TEs use samples only of private firms (Fahy et al., 2000), although it would be more appropriate to use broader samples because ownership has an important impact on business strategy (Zurawicki, 1996). Are different levels of marketing capabilities associated with the ownership structure of the firm? Are different levels of company performance associated with the ownership structure of the firm? Are different levels of marketing capabilities associated with different degrees of business performance? Is there a direct link between marketing capabilities and business performance in SOEs? Since 1989, Cuba seems to be on a slow-path economic transition while maintaining its political model. In order to save its ailing economy from further decline, Cuban policymakers were forced to streamline the economic structure by adopting some capitalist strategies (Agarwal, 2004). In 1998 the Economic Resolution of the Fifth Congress of the Cuban Communist Party tacitly admitted the existence of a market under socialism (Cuban Communist Party, 1998, 25). At that point, the Cuban government introduced some economic reforms and the country began a slow economic transition. Moreover, the Fifth Congress Resolution also dictated the implementation of an Enterprise Optimization Program among Cuban SOEs. The program was first established in the Cuban armed forces (FAR— Revolutionary Armed Forces) in 1988 and was introduced into SOEs ten years later. The central objective of this program was to increase SOEs efficiency and competitiveness (Alhama et. al., 2001; Granma 2007a). In the words of former Cuban Vice-President Carlos Lage, the “Enterprise Optimization Program is the most sound and promising experience that Cuba has implemented to make their SOEs more efficient” (Granma, 2007b, 1, our translation) However, compared to other economic reforms in former socialist countries (for example, China), Cuba has made much less progress in removing the state´s control over business (Travieso-Díaz, 2001) and at the end, Cuba’s reforms are still very timid. Nevertheless, the country has attracted a large amount of foreign investment and is experiencing an increase in brand offerings, consumer purchasing power and the westernization of its retail system (Cerviño and Bonache, 2005). Following Peng´s (2003) model of categorizing market-oriented institutional transitions, Cuba can currently be labeled as a transitional economy in the early phases of a gradualism or “very constrained” capitalism (Shultz and Pecotich, 1997). Cuba´s Index of Economic Freedom (Heritage Foundation, 2012) is clear evidence that its economic transition is at an early stage. The centrally planned Chinese and Vietnamese economies have Index of Economic Freedom scores of 51.2% and 51.3%, respectively (within the group of mostly un-free countries), while Cuba has an index value of 28.3%, making the latter’s economy one of the world’s least free. However, its 2012 overall score is one point higher than the previous year, reflecting slight improvements in fiscal and monetary freedom. Cuba is ranked at the bottom of 29 countries in the South and Central America/Caribbean region, and its overall score is significantly lower than the regional average. This comparison is even less favorable for Cuba for the specific Index of Business Freedom when compared to the general Index of Economic Freedom, where the Cuban score is 10%, the Chinese score is 49.7% and the score for Vietnam is 60.7%. A 10% score means that the overall freedom to form and run a business remains severely constrained by the state. Only limited private entrepreneurship exists. The application of regulations remains inconsistent and non-transparent. Despite its low Index of Business Freedom, Cuba is now officially open to investments and trade from market economies in the great majority of sectors (the Cuban Index of Trade Freedom is 62.2%). Cuba has fairly normal trade relationships with nearly every nation in the world, with the notable exception of the USA though in 2011 Cuba purchased nearly $400 million USD in goods from the USA through some limited contractual agreements related to foodstuffs (chicken, corn, etc.). Furthermore, more than 400 international economic associations and joint ventures (JVs) from 50 different nations were operating in Cuba by the end of last decade. With the influx of foreign investment during the 1990s, the importance of marketing began to grow. Joint-ventures with foreign companies helped to transfer marketing concepts to Cuban managers. Moreover, in this new “learning” and “competitive improved” environment, Cuban SOEs were permitted to undergo reforms to be more market oriented, enabling them to adapt to growing market competition and to the increase in consumer culture among Cuban citizens (Cerviño and Bonache, 2005). However, joint ventures are very constrained to fully implement “good management practices.” For instance, retail mark-up is set by the government. Though there are differences in store location, assortment or ambiance, prices are nearly identical in all retail formats throughout the country. All types of conventional advertising are forbidden and only some types of merchandising and point-of-purchase activities are permitted. The wholesaling and retailing distribution system is totally controlled by state-owned corporations. Furthermore, joint ventures and foreign business associations still cannot directly hire their employees, as they need to be recruited by a state entity (Cerviño and Cubillo, 2005). These constraints notwithstanding, there is clearly a move towards the development of market-oriented strategies and marketing programs, as pointed out by the government in its EOP (Hernández et al., 2004). Marketing capabilities can be described as integrative processes designed for use in applying the collective knowledge, skills, and resources of a firm to the market- related needs of the business, enabling the business to add value to its goods and services while facing competitive demand (Day, 1994; Srivastava et al., 2001). According to Song et al. (2007), marketing capabilities include knowledge of the competition and one´s customers, skill at segmenting and targeting markets, advertising and pricing, and integrating marketing activity. Thus, the literature characterizes marketing capabilities in two ways: market orientation and a competitive marketing mix (Hooley et al, 2005). Whereas market orientation refers to how firms implement a marketing concept (Kohi and Jaworski, 1990), the competitive marketing mix results from the ability of a a business to perform common marketing work routines (Day, 1994; Vorhies and Morgan, 2005), so it refers to managerial capabilities along functional marketing lines (Hooley et al., 2005; Vorhies and Harker, 2000). Market orientation rests fundamentally on cultural values. Thus, creating a market-oriented organization is essentially a process of cultural transformation (Gebhardt et al., 2006; Narver et al., 1998). The Cuban Enterprise Optimization Program is, above all, an attempt by the government to initiate a cultural transformation at SOEs (Hernandez et al., 2004). However, because of their deeper embeddedness within the former institutional context, SOEs are slower than other firms (for instance, private or joint ventures companies) to recognize the value of market- based competition (Fahy et al., 2000; Peng, 2003). H1: Joint ventures with foreign ownership (JVFO) have a higher degree of marketing capabilities than SOEs. There has been considerable research on marketing capabilities and its consequences in business performance (Kirca et al., 2005; Rodríguez et al., 2004; Song et al., 2005, 2007). The rationale for this approach is that because marketing capabilities are rare, relatively immobile, and not easily copied by competitors, they should lead to better business performance (Fahy et al., 2000; Hunt and Morgan, 1995). Empirical research on the consequences of marketing capabilities has focused mainly on the relationship between market orientation and business performance (Narver and Slater, 1990; Jaworski and Kohli, 1993). This research has revealed the existence of a direct link between a firm´s market orientation and its performance either in Western economies (Cano et al., 2004; Kirna et al., 2005) or in transition economies like China (Li et al, 2006; Liu et al., 2003; Tse et al., 2003), Ukraine (Akimova, 2000) or Hungary, Poland and Slovenia (Hooley et al., 2000). However, some researchers in emerging economies or in transition economies such as Ghana (Appiah-Adu, 1998), Russia (Golden et al., 1995) or Saudi Arabia (Bhuian, 1997) found no significant relationship between market orientation and performance, while others such as Grewal and Tansuhaj (2001) in Thailand even found a negative link. This inconsistency in the findings has been attributed to environmental influences that might make a market orientation uneconomical (Ellis, 2006; Kirca et al., 2005; Singh, 2003). Because market orientation research is cumulative in nature, further investigation of such topics in other settings has been recommended to determine whether MO is a truly generic determinant of firm performance (Ellis, 2006; Langerak, 2003). Furthermore, a competitive marketing mix plays a critical role in supporting strategy implementation (Song et al., 2007), and it has been considered a major determinant of organizational effectiveness both in Westerns economies (Song et al., 2005; Vorhies and Morgan, 2005) and in transition economies (Eng and Spickette-Jones, 2009; Tan et al., 2006). Nevertheless, many marketing activities that are fundamental in Western economies are simply nonexistent in transition economies or are adopted at a very superficial level, such as the case of Cuba. Poor profitability of SOEs is usual in many TEs (Shipley et al., 1998; Fahy et al., 2000), because profitability is not likely to be a major objective among managers in this sector (Estrin, 1994) and also because marketing capabilities are very limited among SOEs in the first phases of a transitional economy. In Cuba, SOEs are used by the government to further its social and political goals (Travieso- Díaz, 2001), and their deficient functioning governance and public management are considered one of the main economic problems (Castañeda, 2006). Although the early phase of a transition economy is characterized by the beginning of competition among all corporations (including SOEs) and the increasing importance of marketing capabilities (Fahy et al., 2000), Cuban SOEs are not as well suited to compete when compared to joint ventures with foreign western partners. Though the Enterprise Optimization Program has established knowledge on key marketing tasks within SOEs, marketing is one of the 16 “subsystems” of the program, together with other business activities such as quality assurance, planning, accounting and human resources (Gaceta Oficial de Cuba, 1998). The purpose of this marketing subsystem is to encourage SOEs to carry on market research studies, perform environmental analysis, develop product strategies adapted to the market, manage the sales force and use sales promotion and advertising campaigns (Faloh, 2001). Without doubt, Cuban SOEs that have gone through the Entrepreneurial Optimization Program are likely to have better marketing skills and knowledge than SOEs that have not, but still much lower knowledge and skills than joint ventures with foreign capital. Joint ventures obtain new management and marketing skills through explicit and tacit knowledge, either through expatriate´s business experience, local management training with and outside the country and in-company management and marketing courses. Furthermore, JVs have more financial and technological resources than SOEs. Therefore, when we combine management marketing and business skills and knowledge with available resources, it could be argued that JVs should produce superior marketing capabilities than SOE. Based on this reasoning, we propose the following hypothesis. H2: Cuban Joint ventures with foreign ownership (JVFO) perform better than SOEs. H3: Firms with higher levels of marketing capabilities are more likely to display higher levels of business performance regardless of ownership structure. SOEs in emerging economies such as China are believed to become more and more market-oriented (Liu et al., 2003). Cuba’s EOP dedicated to SOEs is closest in structure and objectives to the Chinese enterprise reform program and the specific strategies of the program in China are very similar to those in Cuba (Travieso-Diaz, 2001). Li et al. (2006) have recently demonstrated in China the positive relationship between a key marketing capability like market orientation, and business performance of SOEs. However, the marketing capabilities of SOEs have not yet been studied in the setting of the early phases of an economic transition such as the Cuban economy. H4: SOEs’ market capabilities will be positively related to performance. Data were obtained from a personal survey addressed to managers of Cuban companies (see Table 1 for details). Gathering marketing data is more difficult in Cuba than in most other countries because the government does not allow surveys to be made without its approval, which usually takes more than a year. Through a joint research program with the Executive Business Center (Centro de Estudios de Técnicas de Dirección, CEDET) of the University of Havana and the research group of University Carlos III of Madrid (MarketinGroup), we were able to survey Cuban executives who were registered in the Executive Business Master Program in the different provinces throughout the country. Marketing capabilities (MC) were measured by market orientation and marketing competitiveness. Market orientation (MO) was assessed with the MAKTKOR scale (Naver and Slater, 1990), a Likert scale ranging from 1 (totally disagree) to 7 (totally agree). The scale has three components: customer orientation, competitor orientation and interfunctional coordination (Narver and Slater, 1990). Marketing competitiveness across the marketing mix areas was measured with a 12–item scale (Akimova, 2000; Hooley et al., 1993). The reliability of both scales is presented in Table 2. Performance was captured by four items traditionally used in marketing studies: (a) sales growth; (b) market share; (c) profitability and (d) customer satisfaction. All these indicators were related and compared to the figures for the firm’s main competitors over the last three years. All responses were provided based on a seven-point Likert scale ranging from “better” to “worse” (than major competitors). The reliability analysis for the scale implemented for capturing performance is presented in Table 3. Ownership structure was defined by classifying companies in two groups, fully state ownership enterprises (SOEs), and joint ventures of state ownership with foreign private ownership companies (JVFO). In Cuba SOEs can further be classify in two more groups: firms which report to the central authorities (SOEsC) and firms with a regional or local reporting (SOEsL). We can observe how JVFOs show a higher degree of marketing capabilities than SOEs in Table 4. For all the components of the MO, as well as for the global measure of MO and MC, the average value obtained through the implementation of the scale is significantly higher for this group of firms. We can also appreciate how the performance of JVFO is significantly higher than the performance of SOEs, no matter if they report to central authorities or regional/local ones. Therefore, through these mean comparisons, we accept H1 and H2. Regarding the third hypothesis—establishing that firms with higher levels of marketing capabilities are more likely to display higher levels of business performance regardless of ownership structure—we can observe how for SOEsC with MO and MC above the median, the average performance is significantly higher than for the SOEsC with MO and MC below the median (Table 5). However, for SOEsL and JVFO we observe how those firms with MC higher or equal to the median present an average performance higher than these types of firms with less MC; more or less MO is not significantly related to performance (Table 5). 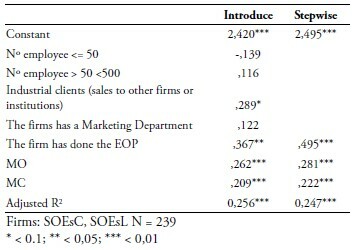 Finally, and based on the results of the two regression analysis performed with the whole sample of SOEs (the second one through the stepwise method avoiding unnecessary information), we can observe how MO and MC have a significant and positive effect on performance, controlling by the size of the company, the existence of industrial clients, the presence of a Marketing Department, and whether the firm has gone through the government EOP. The current research makes several contributions to the marketing field. First, we present and analyze data on marketing capabilities of Cuban SOEs and Joint Ventures; this has not been done before. Second, this is the first analysis of the marketing capabilities of SOEs and Joint Ventures in a very early transition economy like Cuba. Previous research on marketing capabilities in transition economies was carried out when the formerly centrally planned systems had been significantly reformed or when the Communist Party had been removed from the government. No prior research has analyzed the consequences of marketing capabilities on SOEs and foreign Joint Ventures´ performance in the early phases of an economic transition when a Communist government is still ruling the economy, as is the case of Cuba. We first had to validate the measurement scales used to assess marketing capabilities (marketing orientation and competitive marketing mix) in this context. The results demonstrate that Narver and Slater´s scale, with slight modifications, is a valid and reliable instrument for measuring firm´s market orientation in this context (early phase of a economic transition with communist ruling government). Although the scale was first developed in the US, it appears to work rather well in capturing the construct of market orientation in a Cuban cultural and economic context. 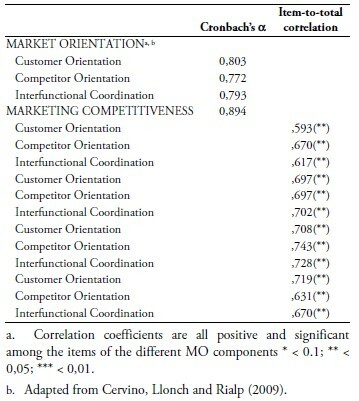 The reliability coefficient (Cronbach´s α) for the market orientation construct shows that the scale is appropriate based on the criteria established in the literature. However, three items had to be dropped from the original scale. One is the importance assigned to after-sales service by the firm. This could be a consequence of the lack of spare parts in the Cuban market as a result of import difficulties (Piñeiro, 2009). The second item is the frequency with which managers from different departments at a firm visit customers; this task is probably not an attribute of market-oriented firms in Cuba because the centrally planned culture still prevalent among Cuban management does not encourage visiting customers (proactive sales management). The final item is salespeople sharing information about competitors. This may not be done frequently because business information is very difficult to obtain in Cuba and certain details remain shrouded in secrecy (Cerviño and Bonache, 2005). We also validated a scale to assess marketing mix competitiveness in early transition economies like Cuba´s. The final scale had only five items: marketing research, distribution coverage in the Cuban market, company/brand image, contracts and relationships with industry suppliers (national and international) and attention and monitoring to the customers. Because prices are almost the same within Cuba, price competitiveness is not an issue in this context. In addition, product items like product range offered, quality, design and packaging also had to be removed from this scale. Due to the scarcity of product offerings in the Cuban market, the situation is more a question of supply than of product quality. According to Batra (1996), SOEs in transition economies tend to have high brand awareness for their products (due to limited brand competition). Finally, the impact of marketing capabilities in firm performance is confirmed and the influence of ownership structure in marketing capabilities and in business performance is also established. Firms with foreign ownership achieve higher levels of marketing capabilities (MO and Marketing Competitiveness) and higher levels of business performance than SOEs. Moreover, another important implication of our study is that, even in a transitional economy as Cuba, marketing capabilities have a critical role to improve SOEs business performance. Hence, developing strong marketing capabilities in SOEs would be an effective way to build a sustainable competitive advantage. It means that, as the Cuban market is becoming more open and freer, in order to be competitive Cuban SOEs should go through a major process of cultural transformation to be more market oriented and better suited for marketing practices than they are at present. Accordingly, one way for SOEs to get these marketing skills quickly would be to set up joint ventures with Western companies. Present efforts made by the Cuban government with the EOP seem to be a useful first step to improve SOE performance, but we were not able to measure how useful the EOP is in enhancing marketing capabilities. Further research on MO in such a business environment is needed, particularly concerning the antecedents for MO and the existence of mediators between MO and business performance. Julio Cerviño is Professor of International Marketing and Co-director of the Masters in International Management at the Universidad Carlos III de Madrid. He received a Ph.D. in Business Administration from Universidad Autonóma de Madrid. He holds an MBA in International Business from Washington University in St. Louis (MO). He regularly collaborates with the Faculty of Accounting and Economics of the University of Havana in academic exchanges and research programs. Joan Llonch is Professor of Marketing at the Universidad Autonónoma de Barcelona. He holds a Ph.D. in business and economics from the University of Barcelona. He is currently Vice-president of Sabadell Bank, the fifth largest Spanish Bank. His research interests are market orientation-performance and measures of marketing success. Josep Rialp is Associate Professor of Marketing and Market Research at the Universidad Autonónoma de Barcelona. He holds a Ph.D. in business administration from the University of Barcelona. He is Associate Editor of Cuadernos de Economía y Dirección de la Empresa (a JCR Indexed Journal).